Made with premium foams for cooling, contouring and pressure-relieving support. 0% APR financing as low as $29/mo. Sleeps cool, with perfect hug, bounce and improved pressure relief for side sleepers. 53" x 75" x 10"
While many mattresses can create a “dead arm” sensation for side sleepers from pressure on the shoulders and hips, the Leesa mattress utilizes our LSA200 Foam Technology™ that contours to every curve of your body so that it feels like you’re floating on air. In science terms, through our LSA200™ Foam we were able to relieve key pressure points, reducing shoulder pressure. Ever wake up in a sweaty tangle of sheets? Yeah, not fun. Our LSA200 Foam Technology™ microcell structure allows for increased airflow while still providing maximum support. It’s important that your mattress maintains its structure, so it feels amazing night after night. That’s why we pioneered an improvement in industry standard durability that our foam experts have never seen before, so your Leesa feels as good as the day you unboxed it. Susannah R Icon/Leesa Blue/Verified Buyer Created with Sketch. We purchased a Leesa mattress for two reasons: The 100 night trial and our loathing of mattress retail stores. We have no regrets - as well as no backaches, no drowsy mornings, and no desire to get up in the middle of the night to try to sleep in the recliner. Couldn't be happier with the purchase. Michael K Icon/Leesa Blue/Verified Buyer Created with Sketch. Dave Z Icon/Leesa Blue/Verified Buyer Created with Sketch. We had a very expensive, luxury mattress. We had noticed that we were both waking up with aches and not sleeping all that well as that mattress aged. We took the chance because of the 100 night trial. Almost immediately we slept better. It took about 4 or 5 nights to get used to the different feel of no springs. Now if i don't kiss her goodnight immediately, I don't get a second chance 10 minutes later. The best part is I no longer get in trouble when I stay up late because she doesn't wake up when I come in the room. I enjoy sleeping with both my wife and Leesa. We're all very happy together. Donald L Icon/Leesa Blue/Verified Buyer Created with Sketch. No need to worry about the 100 night trial period. We love our Leesa. We hated our old mattress because it retained body heat. My husband generates heat. Not so with our Leesa. It's never too hot! Comfortable and restful sleep every night. Best money that we've ever spent on a mattress!! Cheryl G Icon/Leesa Blue/Verified Buyer Created with Sketch. My husband and I have been Sleep Number people since it began but the last model we purchased I didn't feel had the quality or the comfort so we decided to try something different. We both really like this mattress. He prefers firmer, I prefer softer so this was a great meet in the middle choice. The price compared to Sleep Number or Tempurpedic was so much better, especially when trying a different mattress than we were used to. Having the 100 night trial was also helpful but I don't think we'll be using it. Nick F Icon/Leesa Blue/Verified Buyer Created with Sketch. My wife and I were very skeptical about ordering a mattress online, but the 100 night trial period made us feel okay about it. Turns out, we didn't need the trial period to know we loved our Leesa mattress. It took us about 2 weeks to say "yup, we're keeping this!" We couldn't be happier with it. Thomas A Icon/Leesa Blue/Verified Buyer Created with Sketch. I was very reluctant about buying a bed before I tried it. But with the 100 night free trial I figured "why not." Well going from a spring mattress to a Leesa is simply amazing. This bed is beyond comfortable. When my wife and I come up to bed, we have a hard time staying awake for more then 10 minutes. I would recommend this bed to anyone who asks. Kate Icon/Leesa Blue/Verified Buyer Created with Sketch. I didn't believe all of the comments with people claiming they got the best sleep of the lives, but I figured with a 100-night free trial, it was worth it. This is seriously the BEST mattress. My fiance falls asleep seconds (literally seconds) after lying down and we sleep through the night. HIGHLY recommend this mattress! Thomas U Icon/Leesa Blue/Verified Buyer Created with Sketch. At more than 15 years of age, our old mattress was in serious need of replacement. We read many on line reviews of all the mattresses that are available. Leesa had consistently positive comments and the 100 night trial made it entirely risk-free. No need to use the return policy; we are delighted with our queen size Leesa. It's very comfortable. We wake up very well rested. Don't know what else to say-- it's a great mattress and we are very happy with our purchase. Andrew P Icon/Leesa Blue/Verified Buyer Created with Sketch. I did extensive research, trying to find an affordable but excellent option when upgrading our mattress. I decided to go with Leesa because of the great reviews, ease of buying process, and the 100-night trial process. I couldn't be happier with the bed! This has got to be the best value for a luxury bed anywhere! Heather J. Icon/Leesa Blue/Verified Buyer Created with Sketch. We are very happy with our new Leesa mattress. It’s a huge improvement over our old one and we are both sleeping better and have less back pain. Kimberly D. Icon/Leesa Blue/Verified Buyer Created with Sketch. My partner and I are both sleeping more soundly, and I rotate between sleeping on my back and side. I have less back pain, and I'm actually sleeping cooler on this mattress than I did on my standard inner-spring. Louis D. Icon/Leesa Blue/Verified Buyer Created with Sketch. I used to suffer from lower back pain. After getting my new Leesa Mattress, the pain was gone in a couple days! Karen K. Icon/Leesa Blue/Verified Buyer Created with Sketch. Feels like your whole body is being "hugged" by the mattress. I can finally sleep on my back again without causing low back pain. William J. Icon/Leesa Blue/Verified Buyer Created with Sketch. First time in years waking up and not being sore. No more shoulder pain, back pain or hip pain. My ONLY regret with the LEESA mattress is not buying it sooner. Julie M. Icon/Leesa Blue/Verified Buyer Created with Sketch. I have lower back pain often and don't sleep well, tossing and turning every hour or so. But I sleep hours and hours at a time comfortably on our new Leesa Mattress! So happy we decided to get one. Rebecca F. Icon/Leesa Blue/Verified Buyer Created with Sketch. I love this mattress so far. I tend to have back problems often, and I've noticed a huge reduction in back pain with this mattress. I can get out of bed like a normal person versus having to slowly roll my way out. Zee J. Icon/Leesa Blue/Verified Buyer Created with Sketch. One of the best decisions of my life getting this mattress. I absolutely love sleeping on it and don’t get the back pain anymore which I used to get on my old spring mattress. Lauren G. Icon/Leesa Blue/Verified Buyer Created with Sketch. My boyfriend and I have both suffered from terrible back pain. Since sleeping on our Leesa, we don't notice any pain. Amazing mattress and we highly recommend. Lisa E. Icon/Leesa Blue/Verified Buyer Created with Sketch. Best mattress I have ever owned. Help with my back pain and I feel rested in the morning. I look forward to sleeping. Katherine D. Icon/Leesa Blue/Verified Buyer Created with Sketch. My husband and I have had much better overall sleep since switching from a Casper to this mattress. Much softer and cozier. No more waking up with sore hips. Lynn N. Icon/Leesa Blue/Verified Buyer Created with Sketch. We replaced a very expensive high end mattress with the Leesa and found our morning aches and pains disappeared. After Looking at Casper and similar we decided to go with the Leesa given its reviews, especially favorable for side sleepers. My wife and I both being side sleepers happily found this to be true. The Leesa gives us just the right amount of support but with a soft comforting hug. Also, it sleeps cool which is huge on my list. We love Leesa! Jessica M. Icon/Leesa Blue/Verified Buyer Created with Sketch. Best mattress I've had to date! I have a Casper and a Tuft and Needle, and the Leesa mattress has, by far, been my favorite. It is the perfect balance of give and firmness, great sleep... I love it! Richard E. Icon/Leesa Blue/Verified Buyer Created with Sketch. Jonathan C. Icon/Leesa Blue/Verified Buyer Created with Sketch. Been looking for a memory foam type mattress for awhile now, compared the Leesa vs Casper. I must say the Casper is a little too soft for my liking. Ended up keeping the Leesa, the soft/firmness is just perfect. Highly recommend! Handley M. Icon/Leesa Blue/Verified Buyer Created with Sketch. Absolutely love my mattress! I was in between this and a Casper, having slept on a Casper before. And I love the Leesa! Lina P. Icon/Leesa Blue/Verified Buyer Created with Sketch. We tried the Casper and found it too hard for us My husband and I are both decent sleepers, fairly fit, and just wanted a step up from the good old Ikea mattresses we've used forever The Leesa mattress is softer but still provides support No back issues as with the Casper, and prior to that, our older Ikea mattress The Leesa pillow is great, too My parent have the king and they like it a lot for their back issues The Leesa is, for us, the better mattress. Tim P. Icon/Leesa Blue/Verified Buyer Created with Sketch. Yael C. Icon/Leesa Blue/Verified Buyer Created with Sketch. We started with Casper and it was too soft. Then we switched to Leesa and it was fantastic!! Jeemin D. Icon/Leesa Blue/Verified Buyer Created with Sketch. We've tried so many mattresses: Tuft and Needle, Casper, Palm Tree organic. For us Leesa was the right balance of firmness and softness. It seems to have good edge support for sitting on the side of the bed. Toddler approved for softness. The bed is cool. We also had minimal off-gassing. Elizabeth T. Icon/Leesa Blue/Verified Buyer Created with Sketch. We decided to try the Leesa mattress. I recommend to anyone looking for a change. Awesome for pressure points. We wake up refreshed and rested. We would wake up with aches and pains due to our age (72 & 75) Awesome mattress for couples. You don't feel the other person changing positions. Which is what my husband used to do...flop like a fish out of water. Now he rests comfortably and hardly ever changes his sleeping position. Chandler Icon/Leesa Blue/Verified Buyer Created with Sketch. Viola M Icon/Leesa Blue/Verified Buyer Created with Sketch. I've always slept on a coil mattress because that's what I grew up with and I prefer a firmer feel, but when I'd lie on my side for a while I would feel a lot of pain after about 3 hours. With the foam Leesa mattress that doesn't happen anymore. My pressure points are now supported. I read a lot of reviews from other affordable foam mattress companies and I struggled to decide on one--there are so many now! But Leesa was the company that I found with the best price, customer service and return policy. Admittedly, I also tried the mattress out before I invested in the king sized one when my husband and I moved into a new apartment. He has a strong tremor from an accident he was in so when we used to sleep on the coil mattress I felt every one of his movements. On the Leesa mattress, I only feel his movements when he is very close to me. We also wanted an adjustable frame to pair with the mattress and found BedTech to be a good fit for the price and the compatibility, everything works great together. Overall, I'd highly recommend the Leesa mattress, especially for couples. 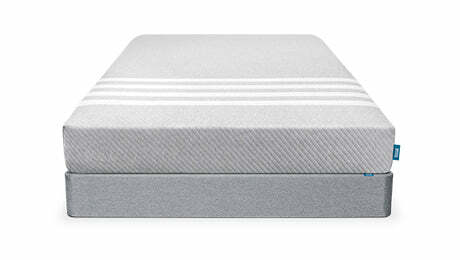 I'm interested in experiencing how the foam wears over time as all my coil mattresses lasted for decades. We'll be sure to rotate every six months to avoid indentations. Alissa Z. Icon/Leesa Blue/Verified Buyer Created with Sketch. We bought the king size Leesa. After just one night my husband said his hip did not hurt him. I have been comfortable and falling asleep easily the last 3 nights. Its is soft yet firm enough that I do not feel like I am sinking in. Lynette M. Icon/Leesa Blue/Verified Buyer Created with Sketch. Best Sleep Ever Perfect for Couples that like soft and firm. I was worried about buying a bed in a box, the only reason being that I couldn't test it. My partner likes very soft best, I tend to prefer firm because of the support. After some deep dive into the YouTube review world, I decided on a Leesa. Then, I found out my friend has one and I tested it out. It was comfy enough, but you can't really tell unless you sleep in a bed overnight, but I decided to get it. It's been over a month, and the bed gets better after a month like the instructions say. It's a dream. I don't have back ache, which I always had with my spring mattress. I don't sink in and feel like I'm drowning in the bed. Instead, I feel enveloped and fall right to sleep. I've heard that the other foam beds in a box are much more firm, so this is why I went with the Lessa, it seems that its the softest (but not just "soft") out there. My partner and I love it because it strikes a balance between the softness that he wants and the support that I need. Worth it! Michelle A. Icon/Leesa Blue/Verified Buyer Created with Sketch. The hype is totally worth it. It was very comfortable immediately, and after a night or two of adjusting to sleeping on it, my husband and I both LOVE this mattress! Best purchase ever. It's the best coming home and sleeping on it after traveling, because it's so much more comfortable than any other mattress! It's very supportive, but also very comfortable. I do sometimes feel my arm falling asleep a tiny bit (maybe like once every week or two) but overall, incredible balance of support and comfort. Very little motion transfer as well, which really helps couples stay asleep during the night. Arthur E. Icon/Leesa Blue/Verified Buyer Created with Sketch. I have slept on Saatva and Casper mattresses and both are comfortable and of high quality. I slept on the Saatva luxury firm mattress for a year and found it to be incredible supportive for my back but the mattress doesn't envelope the body the way the Leesa does. I have found the Leesa to also even be more giving than the Casper. The Leesa also isolates movement the best which is great for couples. It's close but it's the best option for sure. Andrew C. Icon/Leesa Blue/Verified Buyer Created with Sketch. Size of the box made it super easy to bring up to our apartment. I’m a side sleeper and I think this is the perfect mattress for that. Great for couples, you can get in and out of bed during the night and the other person won’t even feel a thing. Definitely the best valued mattress I’ve ever purchased. Regina C. Icon/Leesa Blue/Verified Buyer Created with Sketch. My spouse and I both like a firmer mattress, with a bit of softness right at the top and this mattress fits the bill. We don't feel the other person move nearly as much as with our old mattress. The other thing I wondered about was weather a foam mattress would run hot, the Leesa doesn't at all. We sleep very soundly, ever since night one, it's a great mattress. Christina R. Icon/Leesa Blue/Verified Buyer Created with Sketch. My boyfriend and I are in love with this mattress! We both sleep hot and have had no issues over heating. The support is perfect as well. You won't be disappointed. Perfect for couples! Claire K. Icon/Leesa Blue/Verified Buyer Created with Sketch. After sleeping in a pit of a Euro pillow top for the past 7 years, I woke up for the first night without any back pain my first night on my Leesa. As both a hot and a side sleeper, I had reservations about a memory foam mattress. Now I wish I had switched sooner. After one month sleeping on the new mattress, I don't know that I could ever go back. Richard W. Icon/Leesa Blue/Verified Buyer Created with Sketch. Spent a lot of time looking for a memory foam mattress and shopped some stores. Knew about Leesa, kept coming around to it. Was frustrated because I needed to find something in the middle of firm and plush and the sales person at Leesa characterized their mattress as”medium firm” which sounded perfect. Ordered it, was ready an hour after installation and it is indeed outstanding. Would recommend to anyone who is trying to find a mattress that balances soft and firm. Olivia N. Icon/Leesa Blue/Verified Buyer Created with Sketch. I love how comfortable this mattress is. I've recently had some back problems, so I was glad to experience no pain with the Leesa memory foam mattress. It's firm enough for support, but not so much to be uncomfortable if I'm sleeping on my side. I don't normally sleep well either, but this mattress has allowed me to sleep deeply and longer than I normally do. Mary M. Icon/Leesa Blue/Verified Buyer Created with Sketch. Finally, we have found THE mattress. Simply put, it is wonderful. We own a Tempur-Pedic, and had to add a 3-inch memory foam topper to get the comfort we needed. The Leesa is perfect all by itself. Set-up was simple and easy. I can hardly believe our good fortune in our discovery of the Leesa. Victoria M. Icon/Leesa Blue/Verified Buyer Created with Sketch. I bought this mattress for my guest room. I slept on it and found it was equal to, probably better than my very expensive memory foam mattress. I've also had 2 very different guests sleep on it, one doesn't sleep well yet found this mattress very comfortable, she said she actually got 4 hours of in interrupted sleep! My other guest didn't want to get up, she loves it and says I should buy one for myself. Timothy O. Icon/Leesa Blue/Verified Buyer Created with Sketch. was very skeptical at first because of previous experience with a memory foam mattress but from the first night it has been the best sleep I have gotten!!! Who knew sleep could be so good. Marc D. Icon/Leesa Blue/Verified Buyer Created with Sketch. We decided to move up from our 10+ year old Sealy Posturepedic memory foam mattress. It was the old style solid foam mattress that weighed more than twice what the Leesa mattress weighs. It looked like new but was hot, and we would sink way down...especially when close together. When we rolled apart after being close it would leave a "hole" which would take a while to rise back up. The Leesa mattress weighs less, is much cooler, and much firmer...yet still conforms to our pressure points. When close together and roll apart it recovers quickly. We bought an adjustable frame which works great with it as well. As side sleepers with an occasional roll to our back it's working great. Mark A. Icon/Leesa Blue/Verified Buyer Created with Sketch. I have owned a memory foam mattress once before, and, frankly it was uncomfortable. I did my research this time, and found that the Leesa was very highly rated, so I took a chance and got it. I am happy that I did. The mattress is very comfortable, and even though the instructions said it will be more comfortable after a couple of nights, I found it to be a great mattress from the very first night. I sleep very well, hardly turn at all, and am never sore in the morning. This is definitely the most comfortable mattress I have ever owned! Samuel D. Icon/Leesa Blue/Verified Buyer Created with Sketch. Wasn't sure which memory foam mattress to pick. There are so many of them now, and it's not exactly easy to figure out what sets each one apart. I went with Leesa, and one month later I'm really happy that I did. The firmness is perfect for my back, and it's kept pretty cool despite the onslaught of the muggy east-coast summer. Game-changer! Catherine S. Icon/Leesa Blue/Verified Buyer Created with Sketch. I can now sleep on my side with my arm under my head without having an arm kink when I wake up. My Tempurpedic, which I had for almost 20 years, was just too hard. Leesa has more give to it but still supports my 200 lbs. very well! I wish I'd known of it a long time ago. Jennifer J. Icon/Leesa Blue/Verified Buyer Created with Sketch. Our old Tempurpedic slept HOT. My husband is already getting a much better night’s sleep. And I’m enjoying it too. Andrew W. Icon/Leesa Blue/Verified Buyer Created with Sketch. I'm very pleased with my Leesa mattress. I used to sleep on a Tempurpedic, but when it came time to replace, I really couldn't justify their price. The Leesa is every bit as good for about 1/3 the cost. Robyn C. Icon/Leesa Blue/Verified Buyer Created with Sketch. When hubby suggested switching from our Tempurpedic to a Leesa, I was wary. After all, it's been 16 years of fantastic sleep. Why switch it if it's working? But he persisted and I decided to try something new -- after all, Leesa has a 100-night guarantee so I figured there was no harm it trying it out. I figured we'd be back on a Tempurpedic eventually anyways. But you know what? We're not switching. We love our Leesa! It's so comfortable, not nearly as hot as the Tempurpedic, and I'm sleeping better than ever. Definitely a win all around. Switch to try a Leesa today! Roxanne E. Icon/Leesa Blue/Verified Buyer Created with Sketch. I love my Leesa mattress. I am no longer experiencing the aches and pain that I used to on my old set. I like it better than my Tempurpedic. Michelle O. Icon/Leesa Blue/Verified Buyer Created with Sketch. When it unfolded out of the crate, box, bag, I was stunned. Like really? It seemed like a blow up mattress... Oh how wrong. BEST mattress ever, ever. We threw away our Tempurpedic for this miracle mattress and we will never look back. Michael L. Icon/Leesa Blue/Verified Buyer Created with Sketch. Bought the Leesa to replace a 10 year old Tempurpedic. Was not sleeping well and waking up with backaches. I am now falling asleep faster and sleeping more soundly than before. Kenneth D. Icon/Leesa Blue/Verified Buyer Created with Sketch. We had a Tempurpedic mattress that we just weren’t satisfied with. It had been a very expensive model, so I was very surprised when I saw the price of the Leesa. I thought with your 100 day satisfaction return policy, we would have plenty of time to judge it. Well, it didn’t take nearly that long for both of us to realize that our new Leesa was going to be a keeper. By our second week of having it, we both were sleeping better, and a bit longer too. It’s the perfect firmness for us, and I don’t wake up with an aching lower back anymore. I have recommended this mattress to several friends, and coworkers, and will continue to do so. Kelly C. Icon/Leesa Blue/Verified Buyer Created with Sketch. Love this mattress at our beach house compared to the Tempur-Pedic at our home. I have much less hip and back pain on the Leesa mattress and always look forward to sleeping on it when we get out there. I was worried about buying a mattress without in-person testing but the return policy eliminated that concern. We bought the king-size and it is easy to forget someone else is in the bed with you because there is no shifting, shaking, or movement on my side when my husband gets in/out or rolls over. Very happy with it. Matthew S. Icon/Leesa Blue/Verified Buyer Created with Sketch. Before we purchased the King Leesa mattress, we were not sleeping well and waking up hot. Now, we sleep all night and do not sweat near as much. We are side sleepers and we wake up feeling refreshed. Best mattress purchase ever. Joe G. Icon/Leesa Blue/Verified Buyer Created with Sketch. I had pillow top mattress, medium/firm mattress, and even bought a mattress topper but those don't compare to the Leesa. I'm a back and side sleeper that used to wake up with neck or shoulder pains but not no more. Jill H. Icon/Leesa Blue/Verified Buyer Created with Sketch. I'm a side sleeper, hips have always had pain when I wake up. Not any more! 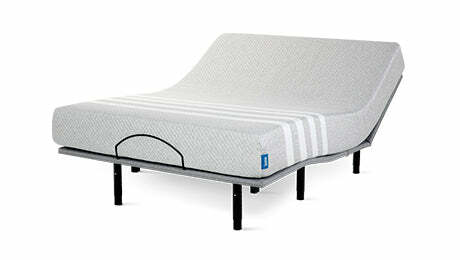 This mattress allows me to sleep on my side, sleep all night and wake pain free. Thank you for such a quality, USA made product! Kristina H. Icon/Leesa Blue/Verified Buyer Created with Sketch. I sleep great in this bed. I'm primarily a side sleeper. I don't wake up sore anymore. Carolyn L. Icon/Leesa Blue/Verified Buyer Created with Sketch. We bought a Leesa when we switched to a king size bed due to our son always ending up in bed with us. Now our bed is so comfy he won’t leave, so we just bought two twin sized Leesas - one for him and one for his brother. I’m a side sleeper and my husband sleeps on his stomach. We both love this mattress! Amanda M. Icon/Leesa Blue/Verified Buyer Created with Sketch. We were in the market for a new mattress and didn't want to spend an arm and a leg to get a good night's rest. LEESA to the rescue! We're side and stomach sleepers and Wirecutter said this was the best bed-in-a-box for that. I was skeptical but have fallen in love (it just took a week or so to get used to the foam after 30+ years on springs). Anthony A. Icon/Leesa Blue/Verified Buyer Created with Sketch. I first slept on a Leesa at a friend of mines house and simply had to have one. I am a side sleeper and was surprised on how well it supports me and how refreshed I feel in the morning. No more morning back pain. Joseph G. Icon/Leesa Blue/Verified Buyer Created with Sketch. I've been sleeping on the mattress for about a month now and I have to admit, it has been a exactly as described. This thing feels like it was made for me. I'm 5'9" and 190 lbs and even though it is very soft, I feel like the firmness is where this thing really shines. I'm a side sleeper and I haven't had any aches at all. My shoulder and hip lay at a perfect level. And honestly I'm more impressed with the pillow. It is literally the best pillow hands down I've ever put my noggin on. In fact the combo is so good, I've been late too work more times than I'd like, just because I don't want to get out of bed. Seriously, this mattress is the real deal. Angelyn H. Icon/Leesa Blue/Verified Buyer Created with Sketch. ‌Great for us as a couple and for me as a 5’6” 114lbs female. I thought I would need something softer since I’m a side sleeper and lightweight, but to my surprise, Leesa has enough contouring without loosing any support and has been just want I needed. After an adjustment period, my body is less achy and not waking in the night. It’s a fabulous mattress! Thanks Leesa! Lizlene D. Icon/Leesa Blue/Verified Buyer Created with Sketch. ‌Very comfortable we would highly recommend the Leesa to everyone. I'm a side sleeper & my husband is mostly on his back. Which ever way you sleep you will wake up refreshed. 1. How long will it take to receive my Leesa mattress? Once an order is placed, we need 2-3 business days to build and compress your mattress before boxing and shipping directly to you. UPS in-transit times vary from 1-3 business days depending on location. We will send you another email with your tracking details as soon as your Leesa leaves the building. 2. How do you set up the Leesa mattress? 1. Unbox your Leesa mattress on its side, next to the foundation or floor. Avoid using a sharp object to open the box as you run the risk of unintentionally slicing your Leesa. Unboxing by yourself? Try placing your foot on one of the box flaps to hold it in place while you pull the bedroll out. 2. Position your rolled up Leesa on any solid or slatted foundation and remove the outer layer of plastic wrap. You'll notice that your Leesa has already started to expand at this point. 3. Unwrap and fold the mattress and tear away the inner plastic. If you tear the inner plastic at the top of the bed, you can pull it straight down and off like a sock. 5. Do I need a mattress protector or mattress pad for my Leesa? The Leesa mattress is available to try and buy at over 100 West Elm and Pottery Barn locations.